In March 2014 I had noticed that Alice’s tummy seemed swollen over a few weeks, and it was larger on one side. Initially I wasn’t overly worried as my son had had a toddler ‘pot belly’, so I thought it was that. But then Alice started to really lose her appetite. She has always been a fussy eater but now she was going for whole days eating hardly anything, and saying she felt full after a few spoonfuls. My husband was worried and went to feel her tummy whilst she was sleeping. He thought it felt like a lump. We made an appointment with the GP the next day. It was my first day in a new job so I couldn’t go with them. I never expected it to be anything serious. Other than her appetite loss she seemed OK. Although with hindsight her energy levels had dropped, but I put that down to nursery wearing her out! At 5pm Andrew called me to say the GP had told them to go straight to QMC (Queens Medical Centre, Nottingham). He sounded really worried so I left work and dashed over to meet them. I didn’t go back to work until June! We were sent straight to the medical assessment unit where several doctors examined Alice. I was worried, but still didn’t think it would be serious. At around 10pm a consultant came to see us and delivered the devastating news – that it looked extremely likely that Alice had kidney cancer. I had never ever considered such a prognosis. At that moment our world fell apart and I could only wonder at how this could be happening when she seemed so well? I also thought of all the worst case scenarios and spent most of the night in tears. We were told we needed to come back the next day for tests. We went home in utter shock, terrified about what lay ahead. Alice was becoming unwell with temperature spikes and high blood pressure, symptoms she may have been experiencing before, but that we hadn’t recognised. The next day we met our wonderful consultant, Dr Hewitt. He immediately put us more at ease and explained what would happen next. He was pretty sure it was Wilms’ tumour and that the biopsy would confirm this. We needed to decide whether Alice should have a portacath implant or Hickman line for the chemo she would need. We found this a very difficult decision to make but in the end we opted for a portacath – we felt it would suit her better and there was a lower risk of infection. Alice was becoming unwell with temperature spikes and high blood pressure, symptoms she may have been experiencing before, but that we hadn’t recognised. That first week in and out of hospital was so tough. Explaining everything to Alice was so hard – she was frightened and didn’t understand why it was all happening. It was confirmed that is was Wilms’ tumour. The treatment plan would be six weeks of chemo before surgery to remove her kidney and the tumour. I was terrified at the prospect of all of this and the possible side effects and I got very upset at the thought of what our beautiful girl would have to go through. But we tried to remain positive and decided on a ‘one day at a time’ approach. She started chemotherapy almost straight away. The first lot made her sick which was horrible. We then had to get her used to having her portacath needled. This was a massive battle at first with lots of tears (from us all) but eventually she seemed to accept it and let the nurses do it without any fuss. She lost her beautiful blonde hair quite quickly which I found really hard. It didn’t bother her at first but she has asked about it since, which is heart-breaking. We were so scared when it came to the surgery in May. We knew the tumour had spread into her vein and that removing it would be tricky. Seeing her go down to the operating theatre that day was awful. But we knew we had to put our trust in the surgeons if we wanted to get her better. After the longest six hours of my life she was back and the operation to remove her tumour and kidney was a success. She amazed us all with her recovery and was out of hospital in a couple of days sporting a very neat scar! 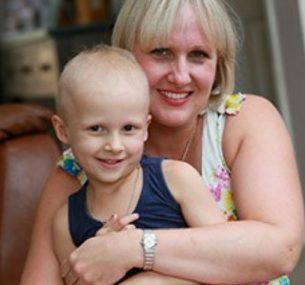 After surgery Alice had nine sessions of radiotherapy and six more months of weekly chemo to ensure the cancer was completely eradicated. She dealt with all of this so well. We have had bouts of sickness and tiredness but we have tried to keep life as normal as possible between treatments. We were very lucky that she has only been admitted to hospital a few times so we have been able to be mostly at home. This allowed Alice to start full-time school in September, which she loves!